It’s a first—a study that tracks antimicrobial use and resistance through the entire beef production process. And it has surprising results. 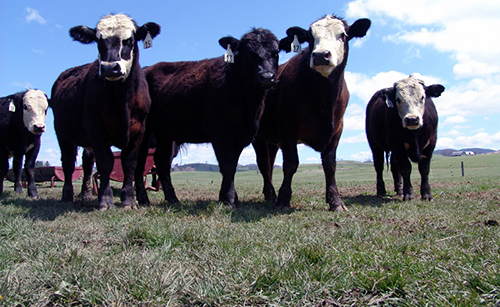 First, an examination of samples from 1741 cattle yielded no resistance genes. Second, an examination of environmental samples from cattle pens revealed the presence of genes that confer resistance to carbapenems, which are powerful “last resort” antibiotics. Carbapenems, however, are not used in the livestock industry. And so evidence of carbapenem resistance in cattle pens points to a third surprising result: The spread of antibiotic resistance is not a one-way street from animals to humans. Rather, antibiotic resistance is more complex, traveling back and forth between animals and humans, presumably via environmental pathways. The study, out of Colorado State University, was led by Noelle Noyes, D.V.M., Ph.D., and Paul Morley, D.V.M., Ph.D., researchers in the department of clinical sciences, and Keith Belk, Ph.D., a researcher in the department of animal sciences. These researchers were so taken aback by the lack of resistance genes in postslaughter meat samples that they decided to rethink the view that it is only antibiotic use that increases resistance. Strict, technology-driven food safety measures prevent pathogenic bacteria like Salmonella and Escherichia coli O157:H7 entering the food supply chain. They include high heat, steam, organic acids, and cutting off parts of the carcass at risk of harboring pathogens. Environmental routes of exposure are much harder to trace and have been largely overlooked by researchers and policy-makers. Many of us never step foot on working farms, but we are physically connected to agriculture via wastewater runoff and windborne particulates. The scientists suggest investigating wind patterns and water flow to see if, and how, resistant bacteria may be disseminated, and how far. “We may find that such dissemination is very limited geographically, or we may find that resistant bacteria can travel long distances if they find the right currents or the right waterways. In either case, this would be very important information from a public health perspective,” explained Dr. Noyes. The results of the current study were detailed March 8 in the journal eLife, in an article entitled, “Resistome Diversity in Cattle and the Environment Decreases during Beef Production.” A resistome is the collection of antibiotic resistance genes in a given environment, be it the gut of a cow or a sample of soil or water. A decrease in resistome diversity could present an opportunity to suppress it further during the feeding period and move toward the lowest risk possible. The article described how the University of Colorado researchers exploited shotgun metagenomics to characterize resistome dynamics in the environment and the products of cohort cattle from feedlot through to market-ready product. The authors concluded that their report highlights the utility and limitations of metagenomics for assessing public health risks regarding antimicrobial resistance, and demonstrates that environmental pathways may represent a greater risk than the food supply.